Derailleur hanger Da Bomb bicycles. Da Bomb Cherry Bomb derailleur hanger 6061 T651, made with CNC technology. Black anodized. Lighter and more durable than the hanger series. Da Bomb Cherry Bomb 2006 derailleur hanger 6061 T651, made with CNC technology. Black anodized. Lighter and more durable than the hanger series. Da Bomb Mind Bomb derailleur hanger 6061 T651, made with CNC technology. Black anodized. Lighter and more durable than the hanger series. Da Bomb Moab Bomb derailleur hanger 6061 T651, made with CNC technology. Black anodized. Lighter and more durable than the hanger series. 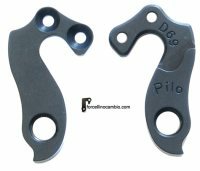 Da Bomb Projectile derailleur hanger 6061 T651, made with CNC technology. Black anodized. Lighter and more durable than the hanger series. Da Bomb XLR-8 2006 derailleur hanger 6061 T651, made with CNC technology. Black anodized. Lighter and more durable than the hanger series. Da Bomb XLR-8R 2006 derailleur hanger 6061 T651, made with CNC technology. Black anodized. Lighter and more durable than the hanger series.